Before I write a book about cheese, I plan to write another tome. Conversations With My Cleaner will feature the wit and wisdom of Tess, my cleaner of two years. I know that my cleaner judges me. She does it openly. Aside from ironing my underpants, Tess has a number of well thought out theories about life, the universe and why I am not married. According to Tess, a woman of my style, savoire faire and general fabulousness should not be without a husband. She believes, the reason for this anomaly is the fact that I only have cheese (and the odd bottle of wine) in the fridge on any given Monday (when she visits). Apparently, a man in search of a wife needs a woman with a full fridge. And mine is usually bounteous in dairy, rather than other more manly items like steak, beer and stuff. Tess should know, she is a grandmother. She isn’t entirely accurate. Yes there is usually cheese. But I do always have chicken in my freezer and tortillas in my fridge. At least once a week I will make enchiladas. They are simple comfort food and the process of making it brings me calm and a general feeling of achievement. I oven bake the chicken fillets in foil (with garlic, chilli and olive oil) before shredding them, adding enchilada sauce and some sour cream before stuffing the tortillas. I then top with a cheese I discovered in the dairy cabinet – Asdero. In Mexico, this is known as Queso Oaxaca and is a white, semi-hard cheese from Mexico, similar to unaged Monterey Jack, but with a mozzarella-like string cheese texture. It is named after the state of Oaxaca in southern Mexico, where it was first made. I would post a photo of the cheese itself, but it’s just a ball of white. 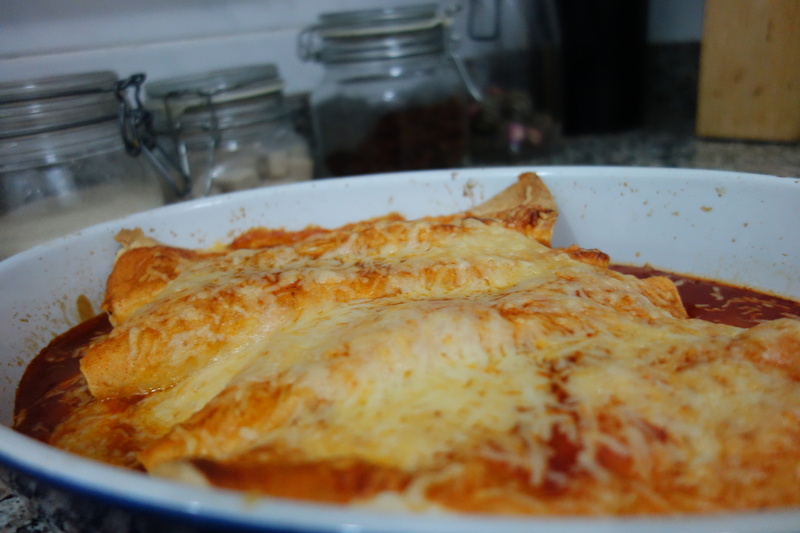 Instead here is the finished enchilada fresh from the oven…I tried every trick in the book to make this look pretty. But let’s face it – it is what it is. Cheese. Chicken. Flour. Red stuff. Goodness. The Mexican cheese itself was mild to the point of bland…so I added some manchego. I have noticed you can buy this shredded already in supermarkets, I prefer my own blend. This enchilada lasts a couple of days, because like any good home chef, I like the process of cooking rather than the eating sometimes (ie I lose interest). The cleaner comes tomorrow. For the first time in ages, there is officially no cheese in the fridge. What becomes of her theory now? Why did I not know this secret love for cheese when we were in Dubai?? Your dinner looks fabulous. And, I really want to know what Tess thinks of the cheese-less fridge! Haha! It was latent then i think. Having a blog is a great outlet though.